Gigan Rocks is the fifth level in the Heroes story of Sonic Riders: Zero Gravity. Chinese-style pagoda temples perch atop vertiginous mountain peaks, but most of the stage's action takes place on the slopes and below, as racers barrel down mountainsides and into the ruin-filled caves below ground. As in Dark Desert in the previous game, the ancient Babylonian technology in the ruins is still partly functional, shifting the course by angles to provide a vast climbing ramp near the end of the lap. A staggering quantity of archaeological vandalism can be committed by gravity driving in this section, knocking down structural pillars to meteor burst along the side of them. After rushing through Aquatic Capital to save Amy from Storm and SCR-HD, Team Sonic arrives to discover the pink hedgehog is perfectly capable of taking care of herself, having blown up the robot and yelled Storm into a cowering retreat. Sonic and Tails posit that their only possible course of action is to take down MeteorTech's Mother Computer to stop the robot rampage in Monopole. Knuckles, however, is able to provide an alternative plan by helping Amy piece together some of Storm's comments, suggesting that information on the Arks might lie in Gigan Rocks: a Babylonian ruin which the echidna is familiar with on account of his treasure-hunting side-job. 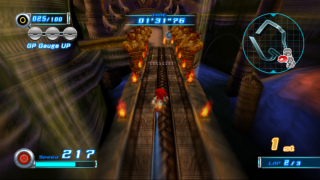 The level itself sees Knuckles outpace SCR-GPs to get through the chasms safely. When the heroes reach the 'sacred chalice' at the center of the ruins, they discover that the 'star shard' is missing (unbeknownst to them, already looted by the Babylon Rogues in Gigan Device). They do, however, find useful information in the form of ancient writings, which Knuckles and Tails decipher as referring to Babylon Garden as some sort of starship. They also point the way to another Ark of the Cosmos in the east. If that wasn't impetus enough, the Rogue's airship flies straight over the ruins, being pursued by Eggman in the same direction; Team Sonic rushes off to join the fun.